CUSTOM BEAUTY IN COBBLESTONE. 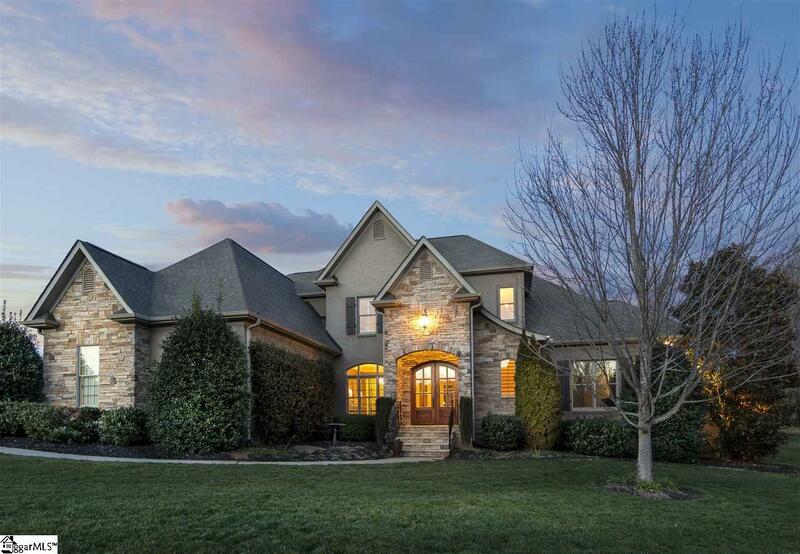 This beautiful stone and brick, two story, 4 bedrooms, 4 1/2 bath home with over 4300 sq. ft. is located on a DOUBLE LOT in gated Cobblestone. The well appointed and meticulously maintained open floor plan features a FRESHLY PAINTED INTERIOR and elegant moldings. Step into the lovely two-story foyer and you will appreciate the gleaming hardwood floors and enjoy the spacious dining room and welcoming living room with a wonderful fireplace and full of natural light. The efficient CHEF&apos;S KITCHEN with double refrigerator, gas cooktop with double ovens, and granite countertops lead to the breakfast area with beautiful views of the private backyard, tile patio, quaint gardens and sitting areas. The COZY DEN off the kitchen features a stone fireplace and built-in bookcases. The master suite on main level boasts his/her closets, tray ceilings and more natural light. The well appointed master bath is complete with plenty of granite counters, double sinks, seated vanity, jetted tub, and custom tile shower. An additional bedroom with full on-suite bath on the main level is perfect for family OR guests. Upstairs you will appreciate the spacious bedrooms with large closets. The wrapping room is a perfect prep space for those special occasions. You will enjoy the BONUS room for family time with built-in cabinets and a wet bar AND a large workout area or game room. The spacious side entry 3 CAR GARAGE will also provide that extra storage space, along with plenty of walk-in attic storage. Cobblestone offers a well-appointed clubhouse, pool, tennis courts, playground and award winning schools. This house has it all and will not disappoint you on any level. Make an appointment today for your own private showing.